Warning: This post is gonna be hugenormous. Feel free to read it in sessions. I'm gonna go all super detailed on an awesome day I had with my boyfriend. Deal with it. If you're here for the introspective stuff, it'll be in another update to follow soon. Shameless plug here: I love Cheeseboy. Made to order grilled cheese with assorted breads and cheeses, and an awesome tomato soup. There's a location up at the Providence Place Mall. There has been a lot of change lately I want to touch on before blabbing about yesterday with Alex. Aforemention Alex has moved in, and has been here for about a week and a half. There was a lot more cleaning that I excpect, and we had to buy a stud finder because he wanted a separate hanger for his towel, and lots of little stuff like that. I find that I've been really good about keeping habits that are better for me. That might sound odd, but I have a terrible track record of starting something that's good for me, and then not having real good follow through. I don't know if I'm trying to be a better person because of Alex (a mix of wanting to be a good person for him or in a different vein wanting to be a person he'd be proud to call a boyfriend) or with all the change that's happened that's been enough of a pushing force for my new intentions to stick. To be honest, I don't really care, as long as my new habits stick. I'll wax on more about this in the aforementioned second update to follow. So, Alex and I went to the Providence Place Mall yesterday, mainly for P.F. Chang's. My friend Dave works tjere and I took up his recommendation of the Mongolian Beef, and loved it. Alex tried the Sweet and Sour Chicken, and didn't like it. After sending it back and trying the Chang's Spicy Chicken, he didn't like that either. So, we paid our bill, and decided to do some shopping before returning for desert. Alex was looking to buy a new wallet and potentially a wristband. I was just tagging along for the ride. 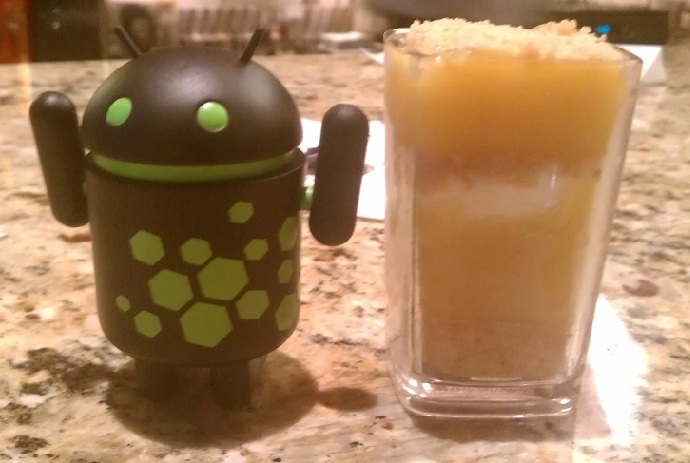 However, during our trip to Newbury's I grabbed an Android blind box, my fifth one in efforts to get a specific one. And I got lucky! Sadly, Alex wasn't as lucky in finding wallets or bracelets he liked. So, Alex went galavanting to several stores, with me looking around and trying not to be surprised at what I thought were horribly overpriced shoes and t-shirts. Hunger drove us to the food court, where at my suggestion we both ordered some Cheeseboy. We both loved our sandwiches; I really can't sing their praises enough. For Alex's fashion quest, we made one last stop to Hot Topic. While there, I spotted a set of bracelets that for some reason fascinated me. They had brass knuckles instead of pistols, but I was more interested in the black and white ones. Alex found a wrist band he liked, and after using a Hot Topic card found out it still had about $50 on it! Sweet! So, as a gift, he got me two of the bracelets. Thank you sweetie! Done with shopping we headed back to P.F. Chang's for desert. Alex ordered a cheesecake mini, while I got an awesome lemon sugar mini. We both loved them. 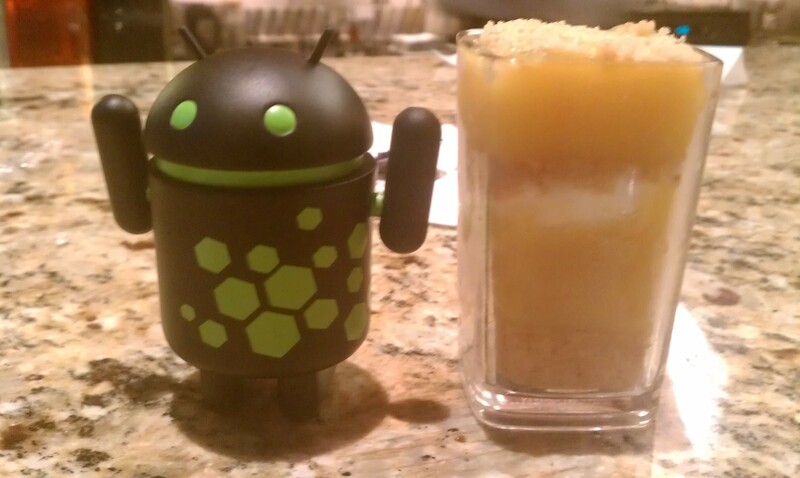 Here's a pic of the Android figurine I got posing victoriously next to my desert. All in all? Good day. Take care and be safe!